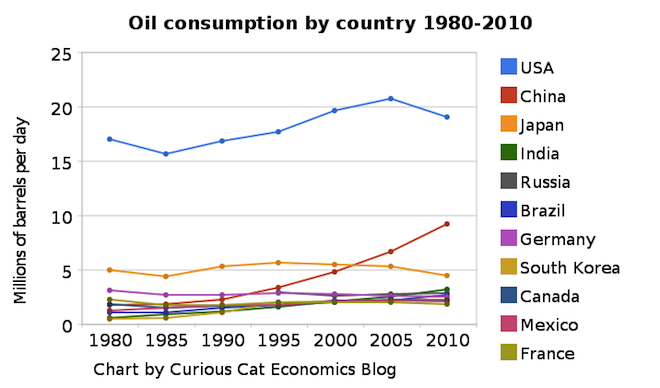 Chart of petroleum consumption by country 1980-2010 by the Curious Cat Investing and Economics Blog. The chart may be used with attribution. The USA remains, by a huge margin, the largest consumer of petroleum products (motor gasoline, jet fuel, liquefied petroleum gases, residential fuel oil…) using 22% of the total (with about 4.5% of the population). From 1980 to 2010 the global consumption increased 38% to 87 million barrels a day. From 1980 to 2010 USA consumption increased 12% (so less than global consumption). Meanwhile, Germany, Japan and France decreased petroleum use by 19%, 17% and 10% respectively. Many countries have very low use in 1980 and have grown their economies dramatically over this period and increased petroleum use dramatically also: India up 433%, China up 411%, South Korea up 360%. Africa, in total, used 3.3 million barrels a day in 2010, up 120% from 1980. Africa used 73% of what Japan used in 2010 and 17% of what the USA used and 50% more than Canada. The data shows no sign of declining petroleum consumption on a global basis. The USA uses as much as China, India, Brazil and Africa combined. I believe, in 2015 those countries (by which I mean all the countries in Africa too, not that Africa is a country, which of course it is not) will use more than the USA (and likely show significant growth from 2010 levels). Data is from the US Energy Information Agency. It looks like the future movement will depend as much on the developing world as it will on the US economy.